Should I stay or should I go now: Why change jobs? For previous generations job security was the key. People wanted to graduate from university and disappear into a corporation that would keep them employed until retirement. Paradigms are changing in a world where there is no guarantee for lifelong employment. That’s why candidates are savvy and hungry; they realise security is not the only factor that drives their search for a new role. Above all, people want career growth. To attract the best candidates, companies should offer career opportunities, not jobs. People’s biggest obstacle to changing jobs is not knowing what it’s really like to work somewhere. Employers should boost their recruitment strategies and market their brand values. People are downsizing; smaller entrepreneurial companies are becoming more attractive to many job seekers. Companies should make sure they showcase their USP’s. Changing jobs: What would give you the nudge? Staying in the same company can make you lose touch with outside world. Your world becomes the internal world; preoccupation with the company in’s and out’s, who’s going up, who is going down, are a few manifestations of a narrow vision. You may feel stale in your job. Perhaps the organisation as a whole has stagnated, and by virtue cannot offer you any personal or career opportunities. Perhaps you’ve just ‘hit a wall’ and feel like there is nowhere to go in your career. When you stay put in one job for a long time, your job becomes mechanical or rote. This stifles creativity and often productivity. It may be time to put on fresh glasses and look at different avenues. As soon as we know a job, part of our brain goes to sleep. We don’t have to stay open and curious. When you change jobs you enter an open-and-curious mode. You’ll accumulate new learning much faster by throwing yourself into new-job territory more often. Once you change jobs, you have to re-establish your value and redefine yourself on your own terms. If you have learned a great deal at your last job and were ready to become a senior manager for example, the person who was already in that position may have hindered you - that person could have been your boss! For your career sake you many want to take hold of a new opportunity. Once you decide to change your job you will have to step outside your comfort zone and enter the world of interviewing. Many candidates haven’t interviewed in years and find the prospect daunting. 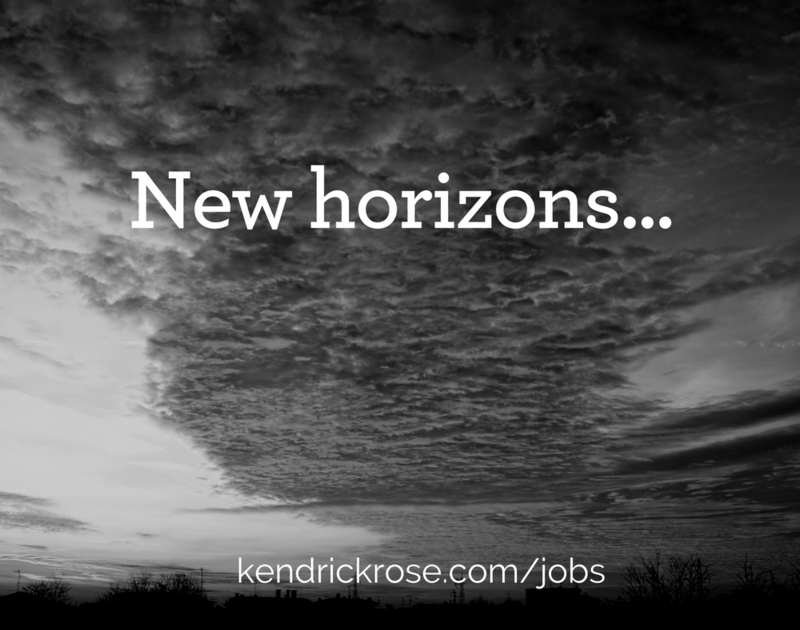 At Kendrick Rose we are here to help you flex those interview muscles and sharpen your techniques so you can choose the right career move. Please feel free to contact us for more information and an informal chat about your career.